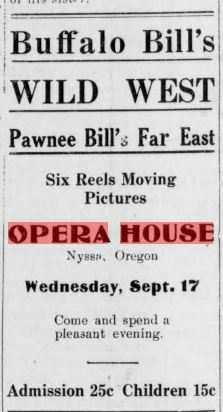 According to news items and advertisements in The Gate City Journal, Nyssa’s local newspaper, the opera house served as a sort of community center in the town. In addition to live theater, and moving picture shows, the opera house hosted dances, minstrel shows, church services, Lyceum courses, graduations, political meetings, and even wrestling matches (Ladies are especially invited!). 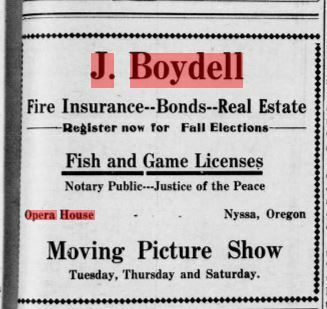 It’s a testament to the relatively small size of Nyssa (449 people in 1910; 563 in 1920) that one of the theater owners, J. Boydell, also conducted a number of other businesses simultaneously out of the opera house building: as justice of the peace, insurance salesman, real estate agent, and dispenser of hunting and fishing licenses. 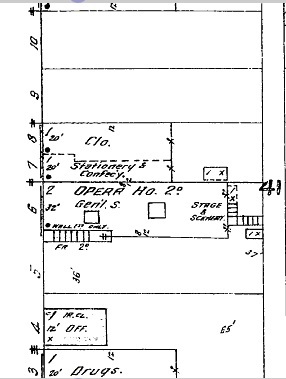 The Gate City Journal, 20 Nov. 1914, p. 3. The Gate City Journal, 11 Sept. 1913, p. 4. 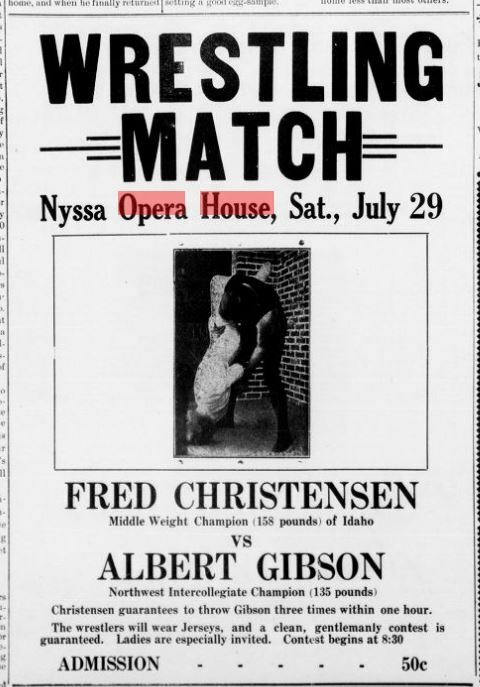 The Gate City Journal, 27 July 1911, p. 2.